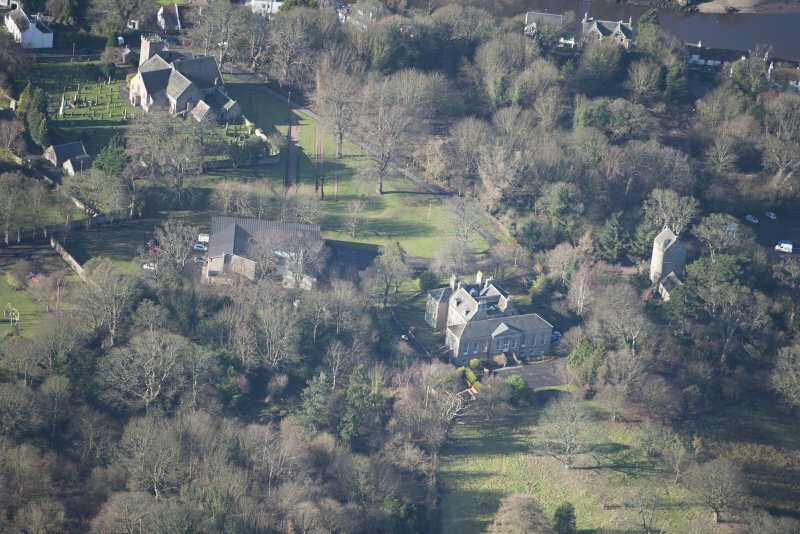 Oblique aerial view of Cramond House and Cramond Tower, looking WNW. 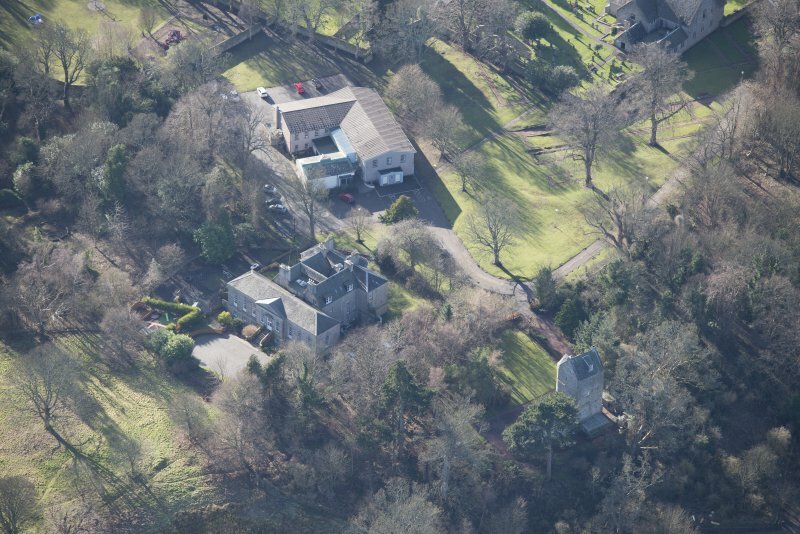 Oblique aerial view of Cramond Tower, looking S.
Oblique aerial view of Cramond House and Cramond Tower, looking SSW. 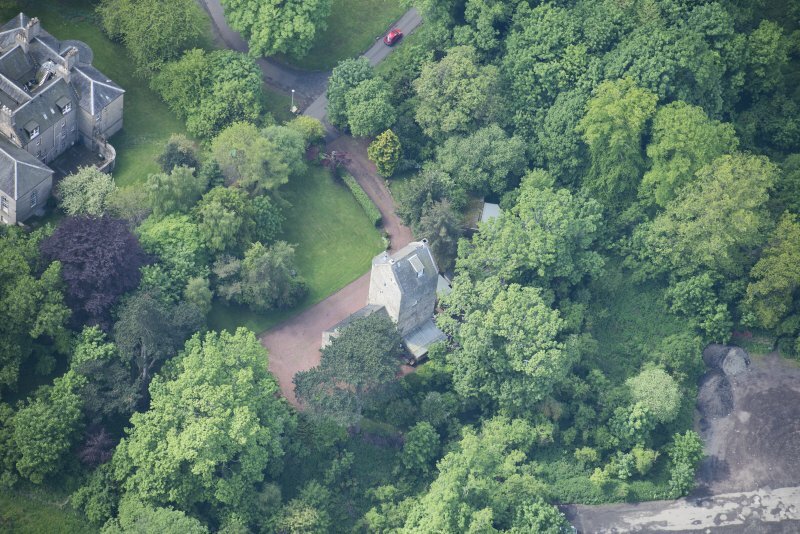 Oblique aerial view of Cramond Tower, looking N.
Oblique aerial view of Cramond Tower, looking W.
Oblique aerial view of Cramond Tower, looking WNW. 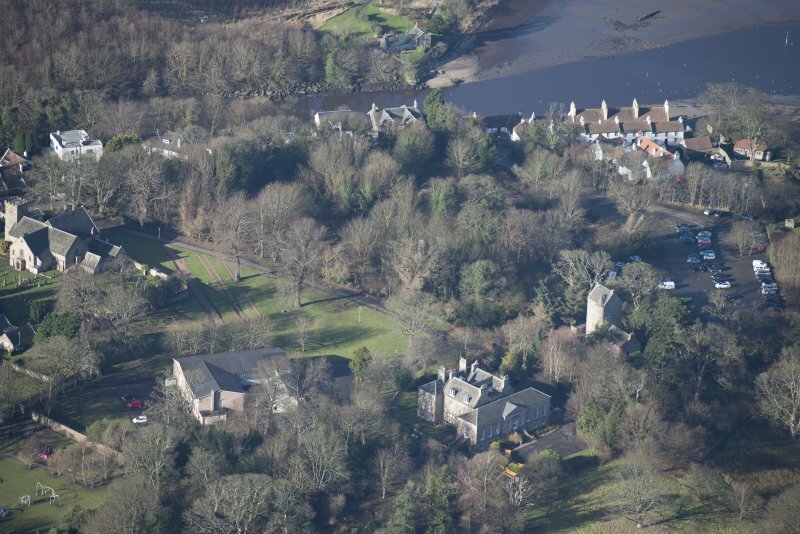 Oblique aerial view of Cramond Tower, looking NW. 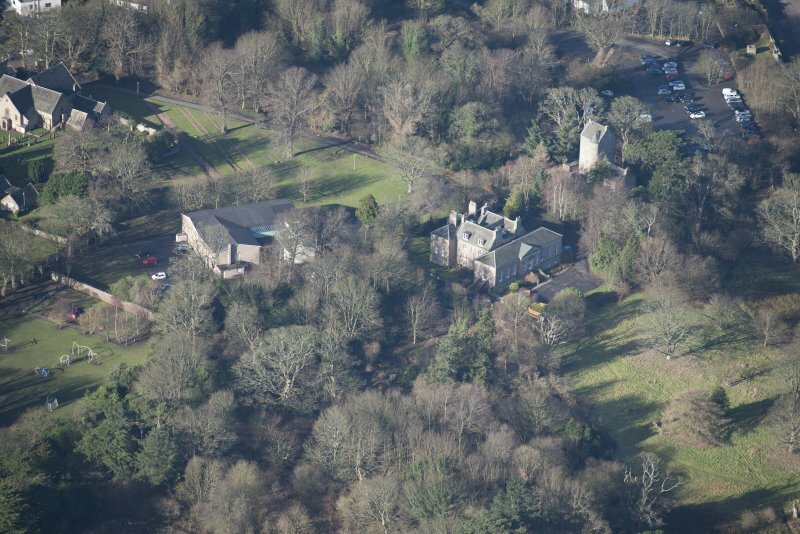 Oblique aerial view of Cramond Tower, looking SSE. 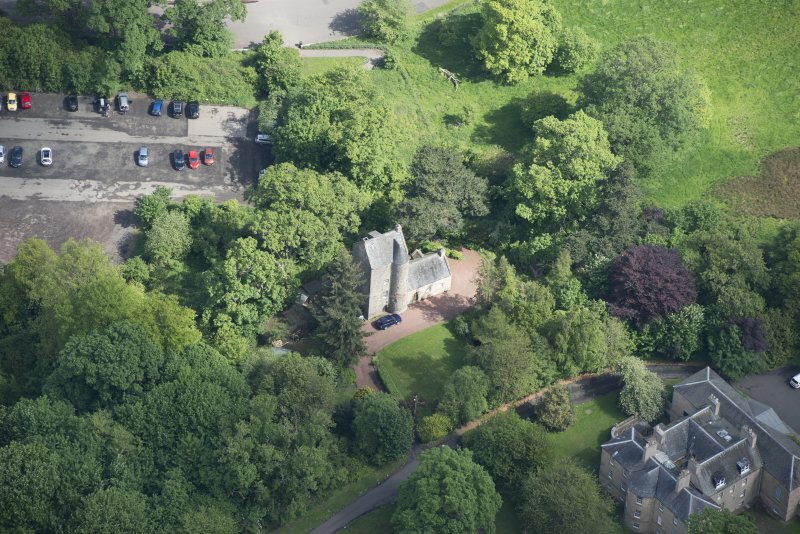 Oblique aerial view of Cramond Tower, looking SW.
Cramond Tower probably dates from the late 15th - early 16th century; it measures 21'8" N-S by 24'9" E-W, with a circular stair-tower projecting from the SE angle. 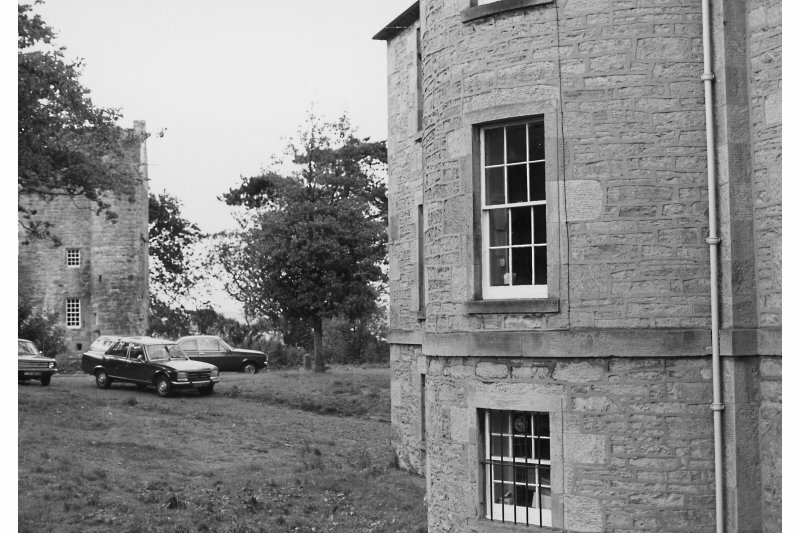 It is now free-standing, four storeys high, but at sundry periods outbuildings of various heights have been erected against the N, E and W walls, though these have disappeared. It is not in a good state of preservation (N Tranter 1963). 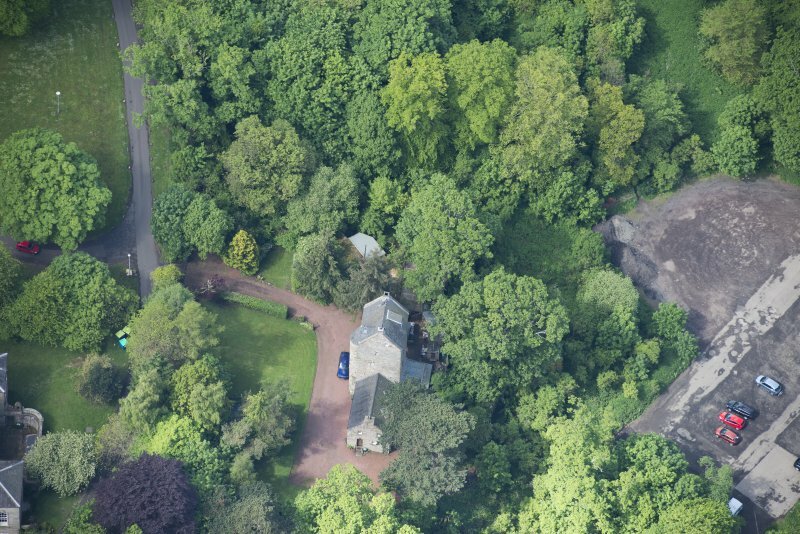 The tower must have been built by the Bishops of Dunkeld. Large stone-built drain, with grating, found to SE of Tower, aligned approx NS between Cramond House and shore. 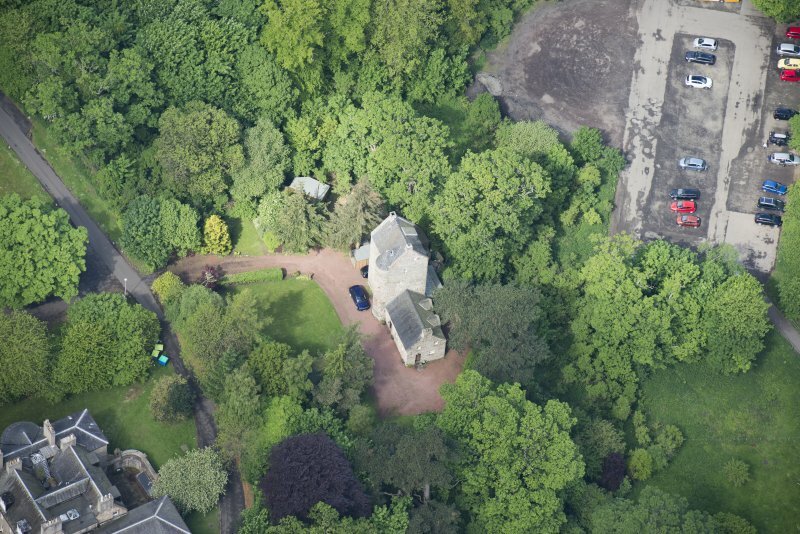 Excavation W of Cramond Tower (NT17NE 4 at NT 1909 7695) on the presumed site of a chapel built for the Bishop of Dunkeld in the early 15th century located two fragments of stone wall and a door-jamb. A pit cut into the natural adjacent to the tower contained fragments of 18th century glass bottles. N M M Holmes 1977. Excavation on W of Cramond Tower revealed two fragments of stone wall and a door jamb. A pit cut into the natural adjacent to the tower contained fragments of 18th century pottery. Relates to NH excavation area T.
Mortared building foundations a few metres W of Cramond Tower, possibly on the same alignment. Small round bronze button-like object with enamelled decoration of human bust retrieved, possibly a religious item. A trench just N of the NE corner of the fort revealed that the inner fort ditch continued northwards to form the eastern boundary of a military annexe which would have enclosed the bathhouse (Disc and Exc Scotland 1975 and 1976, Current Archaeology 59). 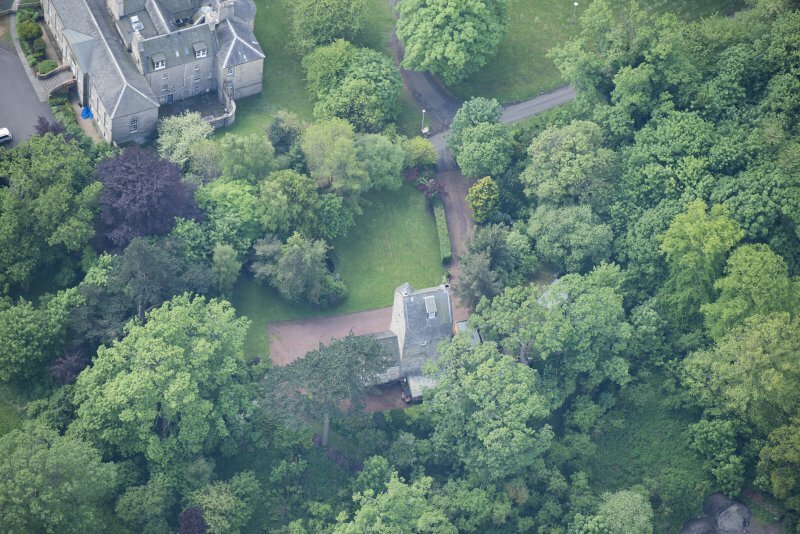 The ditch profile, almost identical to that of the inner fort ditch in the manse garden, had been re-cut. 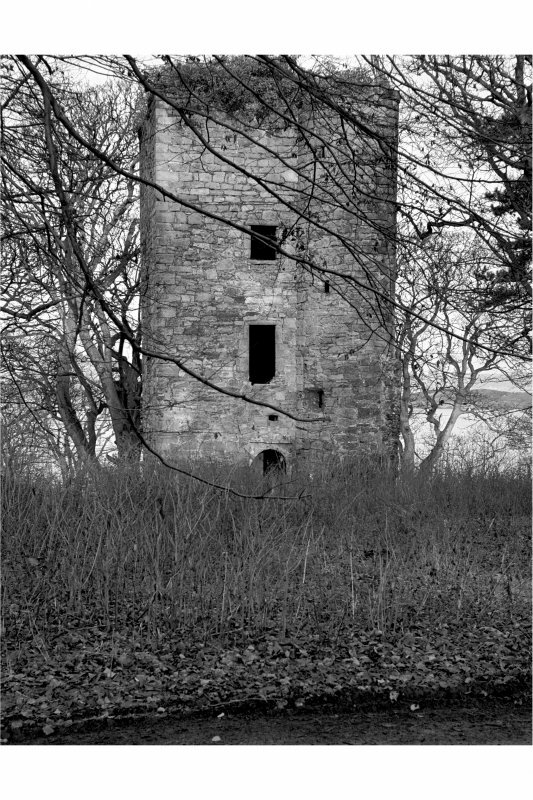 East side of Cramond Tower. 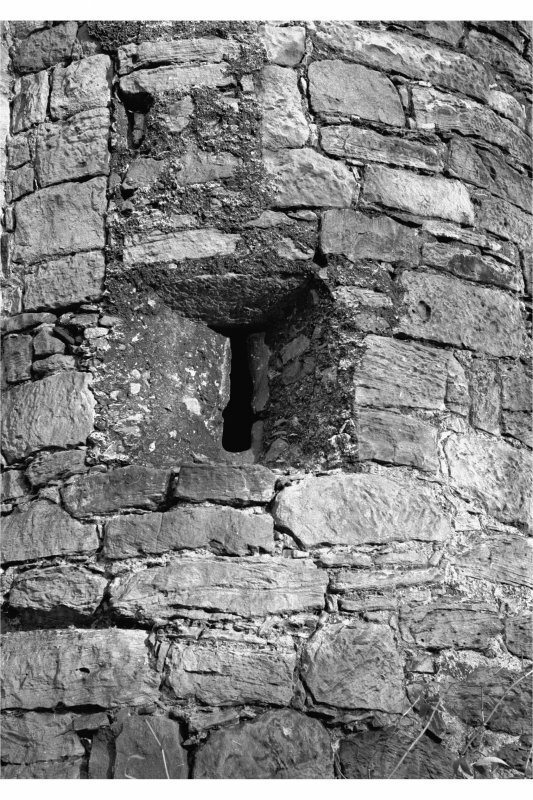 Mortared wall foundations; Late rectangular addition to tower. On same bedding of clay and boulders as tower. Much glass found. 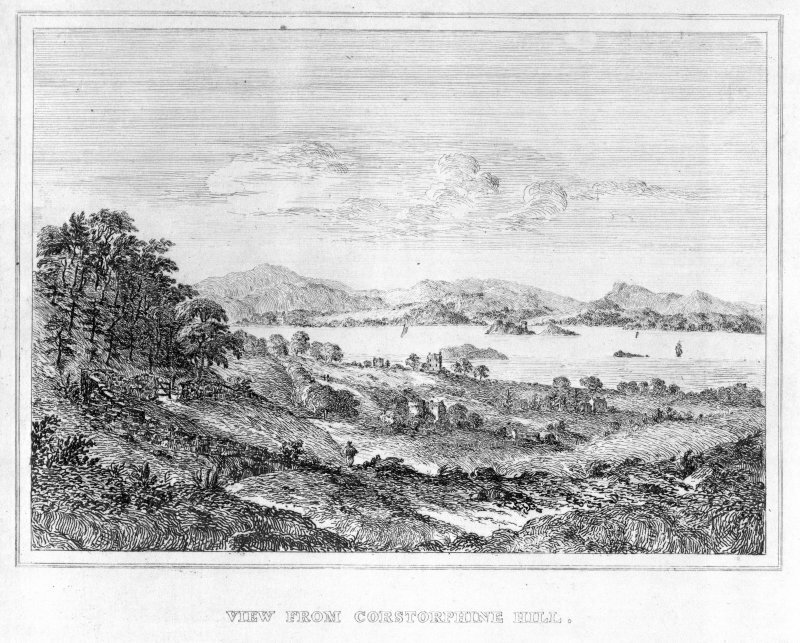 A Roman boundary ditch was discovered in the area immediately S of Cramond Tower, running at right angles to the projected line of the E ditch of the annex (Discovery Excav Scot 1978, I5), The upper levels had been destroyed by early 19th century land clearance, and the surviving portion of the ditch was of standard V-shaped profile with a width of 1.77m and a maximum depth of 1.10m. Initial silting had been followed by a partial recut and finally by deliberate backfilling. Pottery finds suggest an Antonine origin for the ditch, with the recut and backfilling occurring at the beginning and end of the Severan occupation. The ditch had been cut by the digging of a pit which had been filled with large stones: its date and context are unknown. To the S of the ditch was part of a roughly cobbled footpath, c.1m wide, running almost parallel to the ditch. The surface sealed pottery of 17th century type. 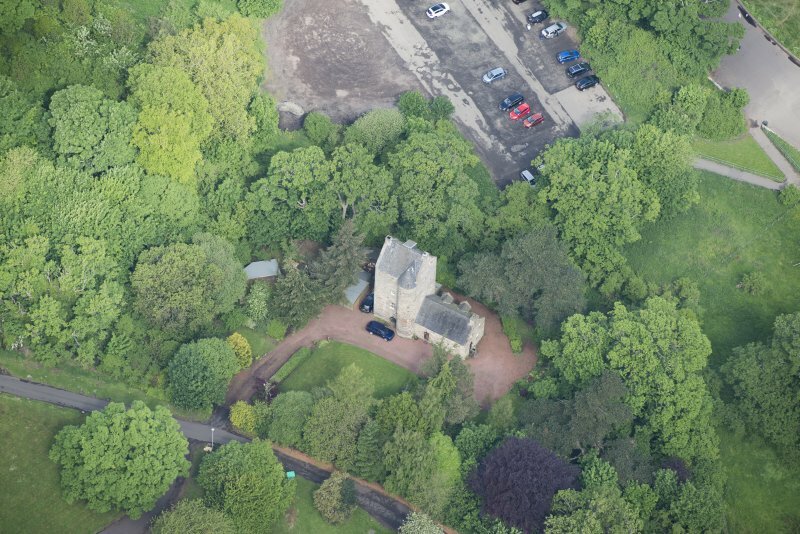 Edinburgh Field Archaeological Society were granted permission to conduct a geophysical survey at Cramond Tower. Three 20m x 20m squares were laid out and surveyed. An irregular low resistance line was recorded, and is thought to be a Roman ditch, parts of which were recorded when a pond was dug for the garden. 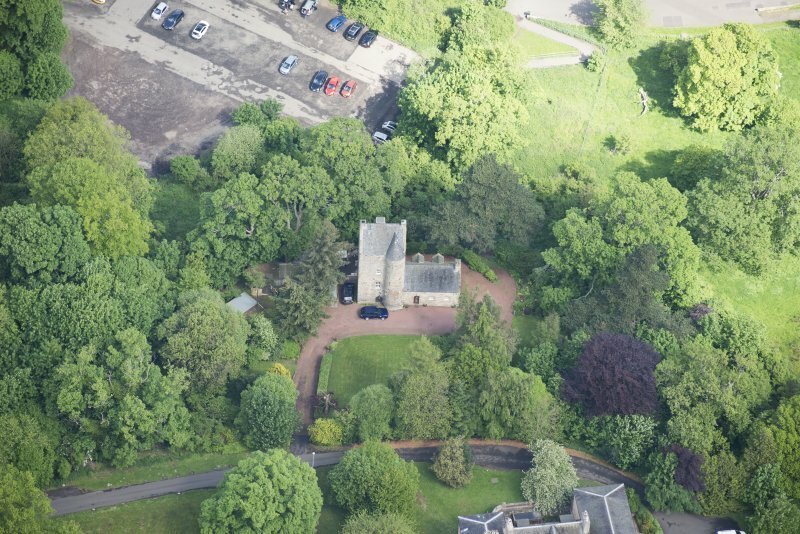 A now unused drain from the 1680 Cramond House was also recorded in the survey. H M D Jones 2006. 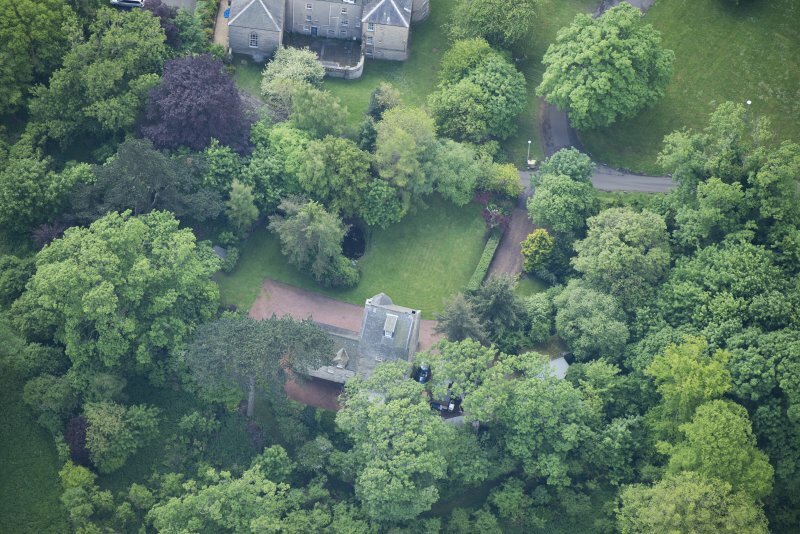 Crop mark showing two parallel curved features below NE corner of flat area in front of E front of Cramond House.